Boone Central students at the Capitol. 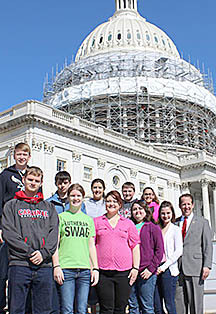 Boone Central juniors and seniors returned last weekend from a busy week in Washington, DC, during their Close Up trip. The Boone Central students, above (front, l.-r.) Trevor Nissen, Grace Woebbecke, Amber Hallberg, Lily Johnson and Kyley Sorell, and (back) Jared Zwiener, Andrew Mousel, Karley Zoucha, Nathan Gottier and Beth Hauger. visited Nebraska Third District Congressman Adrian Smith at the Capitol.